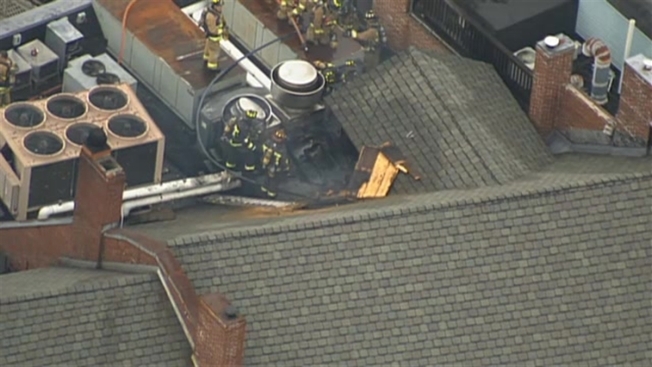 Fire crews are at the scene of a 4-alarm blaze on the roof of the popular Portsmouth Gas Light restaurant. The fire broke out around 10:30 a.m. on the roof of at 64 Market St., which houses the Gas Light. The 3-story brick building also houses a nightclub and several apartments. It is located right in the middle of a busy downtown block that includes many other businesses. Fire departments from numerous neighboring towns are responding, and streets in the downtown area are being shut down as firefighters work to douse the flames.